Caudalie Premier Cru The Eye Cream | £49 // I got a tiny tube of this with a Feel Unique order and started using it when the eczema around my eyes was particularly bad. Only when I had already fallen in love with the product and wanted to buy the full size did I look at the price. Could I really spend nearly £50 on an eye cream?! Needless to say I did as anything that can make my eczema disappear like this cream did is worth it. Also the tiny 2ml tube I first used lasted me such a long time, only a tiny amount is needed, I knew the full size would last a long time. This is definitely not an eye cream for everyone because of the price but if you've struggled with eczema around your eyes then try and get a sample. I'm only twenty-four and have only been using this for about six months or so, so can't really say how well it works as far as the anti-aging properties go. I have very sensitive skin around my eyes and if I use an eye cream that is too thick and heavy then milia will flare up. I haven’t had any of these problems with this eye cream even using it on a daily basis. I use the tiniest amount possible from the pump so I can imagine this lasting a very long time. Nuxe Reve De Miel Ultra Comfortable Face Cream | £23 // The thing that puts me off liking this moisturiser is the scent. It's a very strong perfumed scent that I think might irritate my skin and eczema. Ignoring that as I know fragrance in products doesn't irritate all skin types, it's a nice moisturiser. It's an ok price, not cheap but compared to others it's pretty reasonable. It's meant to be used as a day cream but I find it's perfect for night time as well as it feels slightly thicker than your average moisturiser. If you have oily skin then you might find this a bit too much but for those with dry skin then this is for you. It feels like it sort of acts as a barrier to the colder weather which certainly helps my skin. Kate Somerville Goat Milk Cream | $65 // Firstly I love the packaging and how I can easily control how much product I'm using and nothing goes to waste although I find one pump is the perfect amount. The packaging is a lot more hygienic, no fingers in open tubs, although the only downside is you can't easily tell when it's going to run out. Unlike the Nuxe cream, this moisturiser doesn't contain perfume therefore I'd immediately reach for this one out of the two. It feels lighter on the skin so I'd be able to use it all year round but this doesn't mean it isn't as moisturising, far from it. What drew me to this particular cream and not Nourish was because this is designed for dry and sensitive skin as well as scent free. I find it soothes my skin even if I have a couple of eczema flare ups and can be used morning and night. It's quite expensive even when converted into pounds but I prefer to spend more money on skin care than other products. Shipping was also pretty good and if I can remember rightly, my order arrived pretty quickly but it was quite pricey. Kiehl's Midnight Recovery Concentrate | £36 // This is one of those products that even though I’ve been using it on and off for about six months, I still haven’t been able to make my mind up about it. I don’t know whether it’s meant to be an oil or a serum or a sort of hybrid of the two therefore I’m never sure which step it is in my skin care routine. I also find it doesn’t sink into my skin easily no matter how little I use so it’s left a little bit greasy feeling. I've heard and read about so many people raving about this and I go back to using it but I just can't find the best way to use it. This is definitely one I've recommend trying a sample of first so you don't regret buying it like I do. 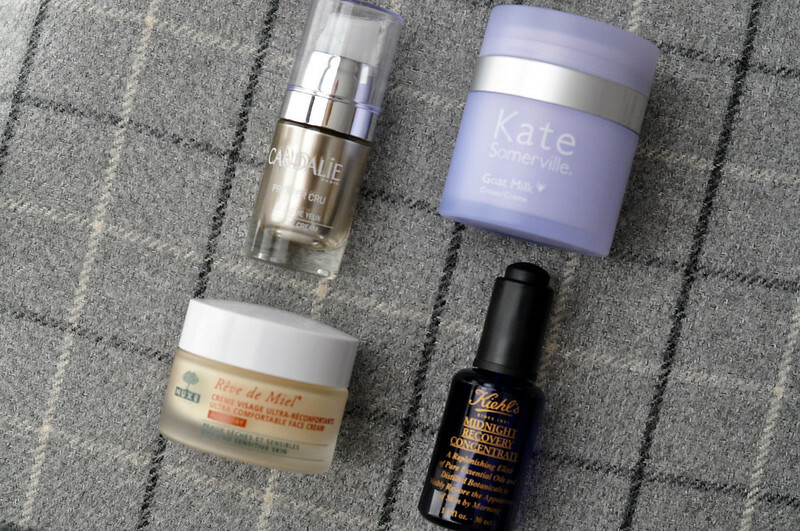 I will finish up the bottle but will stick with something like Estee Lauder Advanced Night Repair which I know works for my skin. Regarding Kiehl's Midnight Recovery Concentrate: where it goes in your skincare routine depends on what your routine consists of. Do you use other serums? Acids? If you use other serums, the rule is to apply the ones that sink in faster first and the heavier/the ones that takes longer to sink in last(acids always go on first, though). I hope that helps. I know exactly how you feel about the Kiehl's concentrate! I wonder if it's better suited for mature skin? Hey Katy I have been an Estee Lauder loyalist too but once I got around to using the the Kiehl's concentrate I ahven't looked back! I usually need about 6 drops for my face and neck and I only use this on bare skin. It absorbs almost instantly and only leaves supple skin.. never had a problem with the absorption.. besides come morning My face has zero grease and very clear even complexion! I think you should give it a continuos one week of use and then decide and try to use it by itself unless your skin is very very dry then you can top it with a simple moisturiser (nothing too fancy! ).